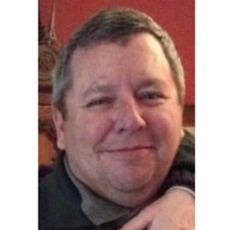 Edward Charles Trimble, 56, passed away on Monday, March 18, 2019 in Shawnee, Kansas. Funeral Service will be at 11:00 AM Saturday, April 6th at the Porter Funeral Home in Lenexa, Kansas. Visitation with the family will begin at 10:00 AM. Ed's celebration will continue at the Red Room inside the "The Other Place" 7324 W, 80th Street, Overland Park, Kansas 66204 immediately following the service. Everyone is Welcome! In lieu of flowers, memorials may be directed to the American Cancer Society. Edward “Ed” Charles Trimble was born May 4, 1962 in Neptune, New Jersey, the son of Charles “Chuck” and Joyce (Heacock) Trimble. Ed graduated from the University of Kansas in 1984. Ed married Susan Ebrite on October 11, 2014 in Kansas City, Missouri. He worked at Cerner Corporation for 26 years before retiring in May of 2015. He was an avid golfer, fisherman and hunter and was a staunch Kansas Jayhawk fan. He is survived by his wife, Susan; his parents Chuck and Joyce; brother Jay and Leslie (Voit) Trimble; sister in-law Elizabeth Ayer; brother in-laws Richard and Scott Ebrite; uncle Allan Thomas. We are all so sorry for your loss. God bless and keep you..